Limiting beliefs are the thoughts preventing you from manifesting your greatest desires. Limiting beliefs are the things causing you to fail at the law of attraction. Limiting beliefs can prevent you from creating what you want. Sometimes you know the thoughts that are holding you back, but most often they're invisible. Even if they are invisible, they have the power to affect your life. For example, if you have the limiting belief that you have to work hard to make money, you might find yourself working long hours just to scrape by. Or if you have the limiting belief that you're going to be abandoned, you might avoid relationships or your belief may control your behavior, causing you to sabotage relationships. Whatever the event, your subconscious mind created a false belief. It gave meaning to the event, and that meaning is affecting you. Your mind is preventing you from taking actions that would allow you to achieve your goals. It doesn't matter how reasonable or intelligent the actions are, you have trouble doing it. Knowing what the limiting belief is isn't enough to keep it from affecting you. It's a good first step in dissolving limiting beliefs, but more is usually needed. 1. Free Episode of the Inspiration Show – This new episode of Natalie Ledwell's Inspiration Show shows you how to root out and release limiting beliefs. It focuses on all areas of your life – love, money, success, family, health – you name it. It works on a wide variety of beliefs, and has been used successfully by thousands of people. The limiting beliefs include doubts, fear of change, family blocks, fear of growth, fear of success, fear of rejection, feeling stuck, blame, lack of self-worth, self-sabotage, fear of scarcity, and so much more. You only have to watch this free episode to understand how to get rid of negative patterns for good. For a limited time, Natalie is also offering a free 5-part video course on dissolving limiting belief to supplement the free episode of the Inspiration Show. You can register for the free belief clearing show and video series here. 2. EFT – EFT, or tapping as it is commonly known, removes limiting beliefs by “tapping” on key energy points on the body. It's kind of like acupuncture with your fingers. EFT requires tapping for a few minutes a day for several days (sometimes a month) to clear a belief. Relief is often felt after the first session, but repeated sessions are usually necessary to permanently clear a belief. 3. Action – Action is about doing the things that you're not doing. Whatever it is that you're avoiding, do it. For example, if you believe that you'll be rejected if you speak your mind, the action you would take is speaking your mind. Retraining your mind in this manner can be difficult because it is in direct opposition to the blocks your mind has created. You will need to take action multiple times to break through your blocks, but it does get easier. When you dissolve limiting beliefs, you can accomplish anything in all areas of your life. So take the time to get rid of yours today. When one is choosing to create their reality by seeing the world as they would like it to be, is looking at the things we would like to change and eliminate from our reality and saying “that is not important, this is what I want” a good way to let go of that resistance? A certain situation I would like to change keeps coming up and when it does I try and change my thoughts, but sometimes it does linger and makes me sad. I know this is a limiting belief that I have to where I believe that I have no control over what happens…just wondering what the best way to go about eliminating that belief is? I’ve been doing EFT and it seems to work temporarily…but then it comes back in the morning. Is it okay that I think about this “negative situation” sometimes, while keeping what I want to happen in mind? Of course the issue is coming back in the morning when you use EFT! 🙂 As I explained in this article, EFT has to be used daily until the belief clears. Using it once isn’t enough. Sometimes it has to be used 3 times a day for 30 days. If you’re looking for an immediate solution, try the Lefkoe Method discussed in this article above. I have been doing EFT. 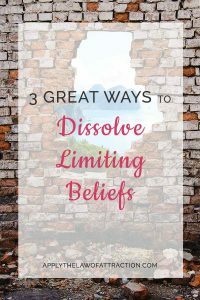 I was wondering if you have any ideas on set up statements and phrases to tap for dissolving limiting beliefs? The statement and phrase will vary depending on the limiting belief. If you need help, you may want to work with an EFT practitioner to help you uncover your limiting beliefs and to develop phrases that will work for your issue(s). This is interesting. I want to share how I take action to eliminate limiting beliefs. A few years ago the company I worked for had a 3 day Life Coach seminar. Part of what we learned was how to figure out what limiting beliefs you had and how to eliminate them. 1. First we identified 3 limiting beliefs through journaling about things we were scared of or worried about. 2. Once you identify your top 3 limiting beliefs, you write out what you WANT your new belief to be. Start your phrase with “I am” or “I Love”. 3. Every morning and evening read over and state your new belief. 4. Any time the limiting belief comes up in your thoughts, state your new belief, think of something you are grateful for, then move on. Your mind gradually changes your paradigm of thought to reflect the new beliefs. It generally takes 3 to 6 weeks to see permanent results, depending on how embedded the limiting belief is.